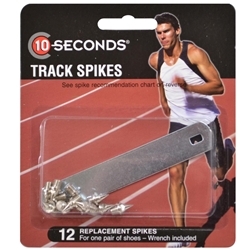 10-Seconds® Track Spikes are made to the exact specifications of the original equipment shoe manufacturers. Sizes available in 1/8", 3/16", 1/4", 3/8", 1/2" and 5/8". Available in pyramid, needle, and blank styles.